Answering The Call to Brilliance, Educator’s and Home Educator’s Essential Guide and Workbook will help you find, nurture and sustain your student’s interests, gifts and passions and integrate them into your learning environment. This easy to follow, step-by-step process, can be used with any system or curriculum no matter what direction your student takes. As you are not tied to one source or manner of study, you can greatly maximize your child’s experience, as you focus on nurturing their natural creativity and personal brilliance. 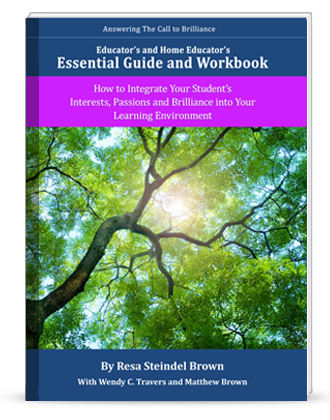 Answering The Call to Brilliance, Educator’s and Home Educator’s Essential Guide and Workbookwill help you find, nurture and sustain your student’s interests, gifts and passions and integrate them into your learning environment. This easy to follow, step-by-step process, can be used with any system or curriculum no matter what direction your student takes. As you are not tied to one source or manner of study, you can greatly maximize your child’s experience, as you focus on nurturing their natural creativity and personal brilliance. This Essential Guide and Workbook can be used at any level and for any age student, pre-school through college. It provides you with examples of hundreds of Creative Learning Activities and reproducible activity forms, along with Exploratory Activities to help you find your child’s interests, gifts and passions, Application Activities to integrate them into your curriculum or learning environment, Lesson Plan forms in which you can in-corporate your child’s active interests and Outcome Worksheets to help you see how you are doing. The book is divided into three units, Unit I Interest, Unit II Passion and Unit III Brilliance. Unit I and Unit IIare for all who educate. Unit III involves bringing students’ brilliance out into the community. It is to be used by home educators and also by educator’s in partnership with their students’ parents. Reproducible Activity Forms: The Essential Guide and Workbook is designed so you can copy and use these worksheets as records about each of your students. Do not write on the originals. We give you permission to reproduce these copies as many times as you want for your own immediate use. We recommend you retain and file all your documentation in a notebook for each student for future reference. “Answering The Call to Brilliance, Educator’s and Home Educator's Essential Guide and Work-book,” is a journey of joyous exploration and discovery, deepening your student's connection to Self in relation to the world. The journey can be done on your own, within the Passion Oriented Education™ community, and/or through our coaching and training programs.